After 3 1/2 years on wordpress.com, My Life as a Foodie has finally grown too large for the nest. 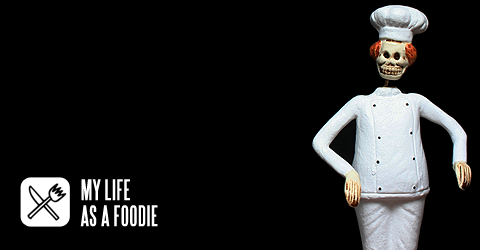 The site has moved to its permanent, self-hosted home at mylifeasafoodie.com. So, if there any of you who bookmarked this site before we actually bought a domain, please visit us at our new location on the web. I have nothing but gratitude for WordPress.com, for helping us launch our podcast and grow the fan base we have, all at no charge. I’ll be forever in their debt. Cheers, and see you on the other side. It had been years since I’d walked into a Claro’s Italian Market. Since discovering “Cortina’s”, a competing small Italian Deli in Anaheim years ago (conveniently located just a few blocks away from my mother-in-law’s apartment) we’d made it a central stop to pick up deli meats, cheeses, and other Italian grocery items you’d be hard-pressed to find anywhere else. Small family-owned Italian markets remind me of my childhood, because visiting one was always a special treat when I was growing up. Italian markets smell . . . . well, Italian. There’s an aroma in these markets you won’t smell anywhere else. Like a fine perfume, it’s a combination of Italian classic aromas – anise, fresh bread, biscotti, garlic, and a musty bouquet that simply can’t be found in an ordinary store. It was early November and, thanks to a tip from my good friend Don that this store was relatively close to my home, I decided to check the store out on my lunch hour. I’m sure few things had changed since I’d been there last. The store would still be incredibly small, with aisles definitely not suited for passing other patrons. There would be a line at the meat counter, with angry patrons anxious to get their sandwich orders filled before the pits in their stomachs grew deeper. There would also inevitably be store clerks equally as short with their patrons. All of this, after all, is status quo in an Italian Deli. You can take the Italians out of New York, but you cannot take the New York out of Italians. As I walked down the narrow aisles, my eyes quickly caught the open cooler section of the store, where cheese and hard salamis were made available. There were no people shopping in that section so I knew I’d have the cooler to myself. I figured a hunk of hard cheese and a whole, bacteria-crusted, dry-cured piece of imported salumi would do me just fine, and I’d be on my way. That is, until I found a basket of fresh olives. It was then that everything changed. Since discovering the wonderful world of curing last year, I’ve been curing everything I can think of. And fresh olives, not being something we see a lot of where I live, was high on my list. I honestly never thought I’d get the chance to cure them myself. I felt like I’d gotten very lucky. So I quickly filled my bag with as many olives as I figured I’d need to get started. At $3.99 a pound, I wasn’t going to be cheap about it. Cured and marinated olives are the perfect compliment to a salumi platter. Like Fred Astaire and Ginger Rogers, you couldn’t imagine one without the other. And by marinating the olives in olive oil, you can use some of this marinade to drizzle on some fresh crusty bread. Throw in a nice glass of wine, and that’s a pretty damned good lunch. Ask any Italian. Once I brought the olives home, a quick scan of my Italian cookbooks gave me the necessary game plan to get these olives brined. You see, fresh olives are generally very hard and especially very bitter. They must be brined for weeks before they begin to soften, and the bitterness is extracted. There are three ways to do this, depending on how much time you have on your hands. You can use lye, salt, or a combination of salt and water. I prefer to brine with salt and water. It takes almost two months, but it provides excellent results. The quickest (and most dangerous) way to brine olives is with the use of lye. In fact, as I was checking out of the store, the clerk asked me how I was planning on brining them. Salt and water, of course. She told me when she was a kid, her parents would be in the cellar for hours with a big bucket of lye, and they were not allowed to enter the cellar while this was happening because of the toxicity of the lye. That alone makes me wonder how Italians have lasted in this country without killing themselves. The olives filled my curing jar. On top of the olives went a brining solution of 1 part sea salt to 4 parts water. Every 7 days, I would empty the solution, then add a fresh brine. I did this every week for 6 weeks. At around the 4 1/2 week mark, I would periodically check how the olives were doing by biting into one. After 6 weeks, the olives were perfectly salted, much softer than they were when they were fresh, but still had that perfect al dente crunch. It was now time to put together a marinade. Now fill the jar with extra virgin olive oil. Cover and refrigerate. Allow to marinade for at least 2 days before enjoying. And do enjoy them. Just watch out for those pits. Quite a number of dentists have sent their kids to college thanks to olives. Don’t be a statistic. Bravo’s long-running show Top Chef may very well be the most successful food show on television. It has seen great ratings success, Emmy awards, spin-offs, and has launched the careers of several truly top tier chefs. There is no questioning its popularity and position as one of the most successful shows on television. In my opinion, it is also in its twilight. After the amazing talent pool assembled for its sixth (and undoubtedly best) season, I had my doubts that the show would ever pique my interest the way it did then ever again. Season 7 was dreadful, and I really wasn’t looking forward to seeing the show try to get its mojo back. It was like sitting and watching your old injured dog walking around the living room dragging his back leg every Wednesday night for an hour. That is, until they announced Top Chef All-Stars. Throw every season’s runner-up and a few also-rans into one big kitchen and you’ve got perhaps the best season of Top Chef fans of the show can ever expect. If the first show was any indication, we’re in for the best season the show has ever seen. In this week’s episode, we’ll be reviewing the highlights of the first episode of the show, which can be seen every Wednesday night on Bravo. • Vote for My Life as a Foodie in the Food & Drink category at the 2010 Podcast Awards. If I win, you’ll be treated to something special.